This month's new moon falls in the sign of of duality, Gemini, which embodies the initial archetype of diversity and the dispersal of information in its many manifestations. It also happens to be a partial Solar Eclipse, taking place in the south nodal direction, and thus relates to a process of letting go, releasing, and transmuting past and outgrown energies. In Gemini, we are releasing past prejudices, judgements, petty details, and overt reliance on facts and numbers in favor of a much bigger and greater holistic picture which transcends all mental constructs, indicated by the North Node in Sagittarius. Jupiter, the dispositer of the North Node, sits at the anaretic degree of Aries, thus indicating a critical karmic shift taking place within the collective psyche, suggesting the need to expand into new directions and new frontiers entirely, literally taking the road less or never traveled. The Eclipse itself isn't particularly significant in its strength, considering its wide distance from the South Node of the Moon, however, it is involved in a strikingly dynamic grand trine with Saturn in Libra and Pallas in Aquarius, as well as a rather wide, and poignant T-Square with the Neptune/Transpluto Opposition. This is a strikingly clear Air grand trine, and thus relates to the mind, creating a closed circuit construct within the collective, indicating that many may be impulsed to dwell on and even get stuck thinking about some cause or event in which they have no control, and possible obsession with problem solving and attachment to one's own ideas, especially if such ideas are rejected by others who don't see eye to eye. This can generate the archetype of intellectual snobbery, fueled by a delusional sense of superiority. Alternately, if used correctly, this can generate some great new and innovative solutions, while also being conscious others. Our way out of the structure is through the Solar Eclipse/New Moon itself, which squares the Neptune and Transpluto conjunction, and this is urging us to see deeply past our delusions, and also, to not get too caught up in overtly rational solutions or explanations for problems- seeing that reality is not static as the ego/mind complex would have us believe, but rather, reality is constantly changing based upon our collective agreement of it. The Neptune/Chiron conjunction in opposition to Transpluto, is stirring up a very deeply ingrained mythos contained in our collective memory, the myth of Christ, yet it is working to reveal the true Cosmic Christ as a spiritual and archetypal entity as opposed to a physical person who will one day return to Earth generated by the past two thousand years of a messianic/savior delusion. This all brings me to an interesting collective event which has recently transpired which got a lot of collective attention. As we know, if you're familiar with my blog and or with a Jungian perceptual lens, collective events reflect a society's collective psychology, they are tangible symbols informing us of our intangible unconscious state. While "newly opened lands" theoretically offer virgin fields for experience, in fact those men and women who reach them find themselves conditioned by their own past. They carry the ghosts of their former lives and the memories of collective social patterns with which they had identified their egos. Every new beginning is surrounded with ghosts (or personal and social karma). The racial struggle for equality of opportunity must go on, even if this equality is officially guaranteed by the Law. The struggle is within and takes many forms. The Puritans brought to the theoretically "New World" the fears, the fanaticism and the aggressiveness of their European existence, and these often grew more virulent under the conditions found in the New World. But no field of activity is ever totally "virgin". It has its inhabitants, and they cling to their possessions or privileges. Whoever seeks to be truly an individual must be liberated from the past. A more in depth look at this subject is a bit beyond the scope of this article, and will have to be covered at a later time. For our purposes here, it is important to be conscious of these energies and how they are playing out in our collective drama, as well as the drama of our own personal lives. In looking at our own lives, and as we set our intentions which are greatly amplified by the Lunar eclipse, let us look at how we can completely break from the past, how we can heal the ghosts, the past and unresolved wounds, and create something entirely new without much hindrance from these shadows. This doesn't mean that we annihilate the past, for it offers us much lessons and gifts, but we mustn't allow the past to completely condition our future, we must have the ability to let go of what is no longer functional for our lives. Looking to your own life, how do these archetypes have relevance? Are we sitting around waiting for someone or something to save us from our predicament? What is keeping us from making change ourselves? Are our wounds so painful that we wish, unconsciously, we could simply be delivered from our suffering without having to face it? It's much easier to project all our hopes for salvation onto some figure who represents the change we refuse to create ourselves. Until we as a species realize our own power we will forever be disappointed with our saviors, and our prophets. In the end, such prophecies of doom stem from an unconscious fear of annihilation, which is a fear that belongs to the mind, and to the ego, which are temporary constructs the soul chooses to use throughout its incarnation. All fear is illusion, it serves us no useful function other than to shut us down, and incapacitate our senses, leaving little energy toward the more useful fight or flight mechanism. From the occult perspective the apocalypse is the unveiling, it lifts the veil of fear to the truth of infinite bliss. Hardly the end of the world. Harold's prediction didn't unfold, and everyone had a good laugh, or possibly a good cry, and went back to business as usual. 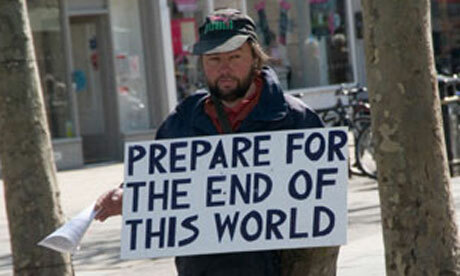 A day later, Harold emerged from his home in California to announce he had, once again, miscalculated the date of the rapture, and that the new date would be October 21, 2011. This date is strikingly close to the proposed actual end date of the mayan calendar on October 28, 2011. No, I am not proposing that Harold is right and that the world will end, but I am saying that Harold is acting as a channel, because he is highly unconscious of the archetypes which impulse him, which is informing us, through symbolism of the Judeo-Christian mythos, that something is in fact happening to us, a powerful yet subtle shift in consciousness, just as the mayan calendar indicates. The Mayan calendar does NOT predict the end of world, but rather records and predicts evolutionary leaps within human consciousness in synch with the entire cosmos. The "end of the world" scenario is projected by the mainstream media because it is an unresolved collective fear and trauma stemming from a catastrophe our species experienced long ago. What we need here is a LIQUIDATION from the past, to clear our cluttered minds and make way for new visions for the world. This clean slate allows us to step up and strive for our actual and currently hidden human potential, which is veiled by a cloak of fear. We need to let go of our dependence on prophets and saviors who take away our power, our free will, in favor of a delusional scenario in which all our problems suddenly vanish without the need for processing and resolution. Revolutions are not the objective, they serve no functional role than to shock the psyche into a new evolutionary pattern; the true objective is Evolution, which is a conscious unfolding with divine intention. This unfolding is governed by time which is mirrored in the cycles of the planets, and if we can be conscious of these cycles they will no longer possess us collectively. As we set our intentions this Lunar Eclipse/New Moon keep in mind that your intentions are being greatly magnified, positively or negatively. The results of what we intend this New Moon will have much farther reaching consequences than with other New Moons. How can you completely break with the past to create an entirely new frontier? How can we free ourselves and find liberation from the ghosts that hold us back? What's keeping us from being who we were truly meant to be? How can we let go of our ideas of the future, our judgements and assumptions of the unfolding so that we allow ourselves to just unfold and trust in divine intention? Take some time this New Moon to simply clear your mind, get more grounded and connected to what's real, whats tangible in the now, so that we can get clear about what we want to create in this magnificent world.